Milk Hill, Wiltshire in 2001. The crop cirlce measured more than 800 feet across and covered about five hectares. 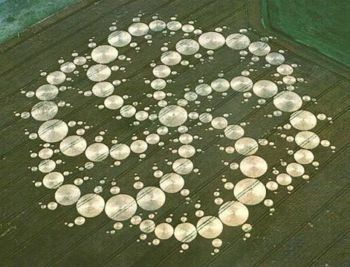 Crop circles are geometric patterns which are created in fields, usually wheat, grass or oats fields. Some people believe crop circles have mysterious origins despite a lack of any supporting evidence, the astonishing circular symmetry of many crop circles have been cited by supporters of extra terrestrial influence in their creation. However it has been shown many times that circular symmetry and impressively straight lines can be achieved by using very simple items available to anyone. Crop circle enthusiasts are known as cereologists or croppies. Cereologists maintain that they rigorously and scientifically study crop circles, however they are often without serious credentials and many have been proven wrong when they have claimed that certain crop circles are undeniably not the work of humans. Doug Bower and Dave Chorley were the first to start making Crop circles in 1976. The original intention was to prank people and the secret was kept until 1991 when the pair admitted to the hoax in a British newspaper. Since gaining international publicity crop circles have been found around the world. Crop circles were central to the plot of the film signs, in which the crop circles were presented as being the work of aliens. Signs boosted the exposure of crop circles worldwide, but also fed the misconception of non human origins. To this day crop circles are at their most common and most sophisticated in England where the practice of making them began. Whilst crop circles cause a lot of damage to farmer's crops they also generate a good deal of tourist revenue, especially in areas such as Wiltshire which has a particularly large number of them every year. Doug Bower does not believe crop circles have any significance despite their astonishing circular symmetry. In contrast, some people believe that the crop designs are messages from alien spacecraft. Some maintain that the aliens are trying to communicate with us using ancient Sumerian symbols or symbolic representations of alien DNA. Those who engage in such serious study and theorizing about crop circles are known as cereologists (after Ceres, the Roman goddess of agriculture and fertility) or croppies. Crop circles have been found around the world, including the United States, Canada, Australia, and Russia; some believe that also in ancient civilizations like in Aztec fields or in the construction of Stonehenge and Hadrian's wall between England and Scotland. (Stonehenge, geometric pattern.) Dr. Eltjo Haselhoff has written a comprehensive book on crop circles, including mathematical analysis and field research. He argues that most crop circles, including some reported hundreds of years ago, were almost surely not made by human means, citing a higher design complexity and strange bends in the plants. ↑ Ridley, Matt (August 2002). "Crop Circle Confession". Scientific American. http://www.sciam.com/article.cfm?chanID=sa006&articleID=00038B16-ED5F-1D29-97CA809EC588EEDF. Retrieved 2007-08-16. This page was last modified on 13 July 2016, at 02:08.